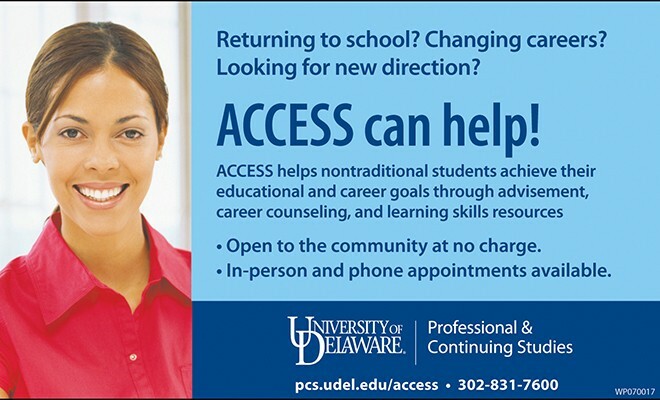 The Adult Center for Continuing Education Student Services (ACCESS) at the University of Delaware provides free advisement, career counseling, and credit course registration for individuals who wish to achieve their educational and career goals. Those who visit the ACCESS Center receive assistance with exploring careers and developing personal career plans. If visitors are unsure of what careers to pursue, the center offers various tests to help them choose fitting career paths. The advisors can also help students choose majors and courses. High school students who want to get a head start on college requirements or improve their chances for college admission can also visit the ACCESS Center to learn about UD pre-college and dual-enrollment programs. The ACCESS Center is located on UD’s Newark campus and is open 8 a.m. – 5 p.m. on Monday, Tuesday and Friday, and 8 a.m. – 8 p.m. on Wednesday and Thursday. To make an appointment with an advisor, call the ACCESS Center at 302-831-8843 or write to access-advise@udel.edu.